Hmmm, mum wants to know if you would come over the alternate weeks and clean here. She hates cleaning! Mom want one of those ! I'm looking forward to reading about how Bob holds up over a longer period of time, say maybe three to six months? 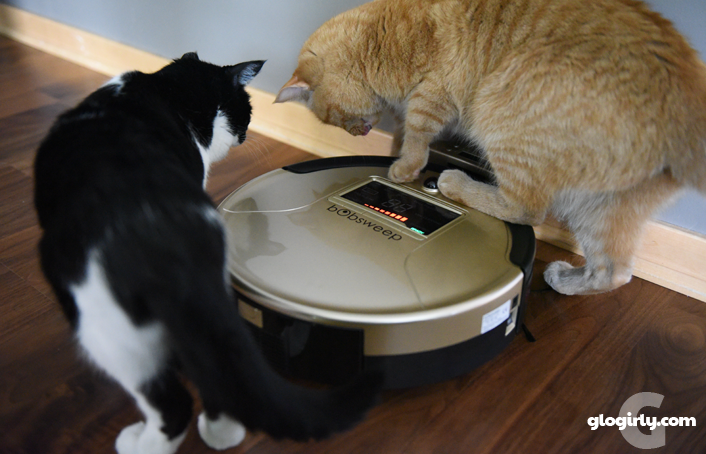 We had a different brand of robotic vacuum several years ago and it wasn't able to keep up with our mess. 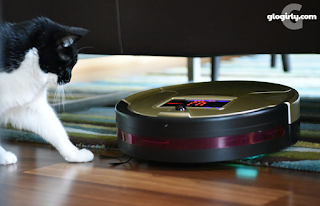 Of course, I'm not able to keep up with the mess of 4 felines, plus one teenager, so,I can't blame a robot for not being able to stay on top of our mess. Poor Mr. Roomba was simply over-matched back then. Hopefully Bob will be made of stronger stuff. I'd love to leave the Dysons in their closets regularly so my fingers are crossed! Wow, Katie was WAY more interested in Bob than Waffles! Who knew? 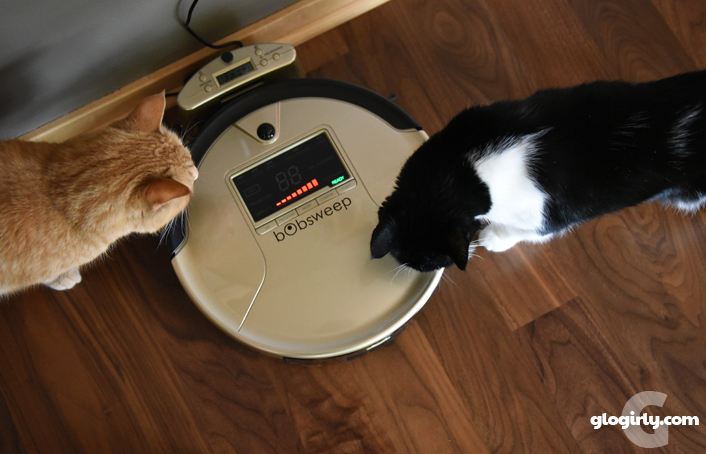 My human could use a between-real-floor-cleanings robot, but she's not so sure Bob would work for us, as we have grooved plank floors. 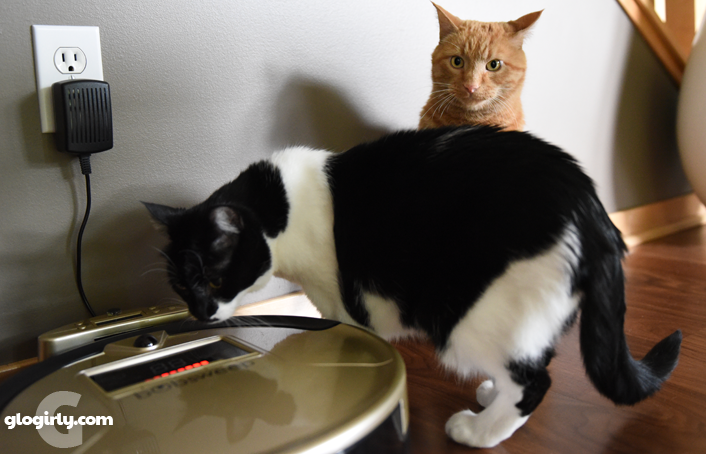 Why do I get the feeling that Katie is plotting a way to devise an 'off' switch for Waffles? I loved the part in the video where Katie tries to play with Bob - so cute! 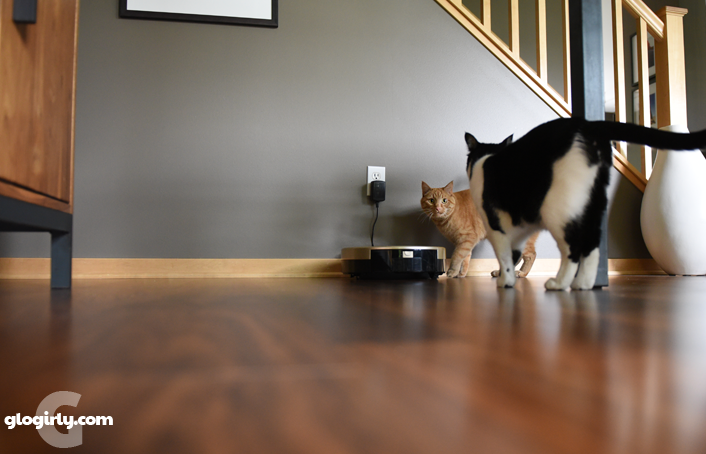 Katie seems quite interested in Bob, Waffles more interested in keeping out of the way. Mum says he looks like a good friend to have. Great post! 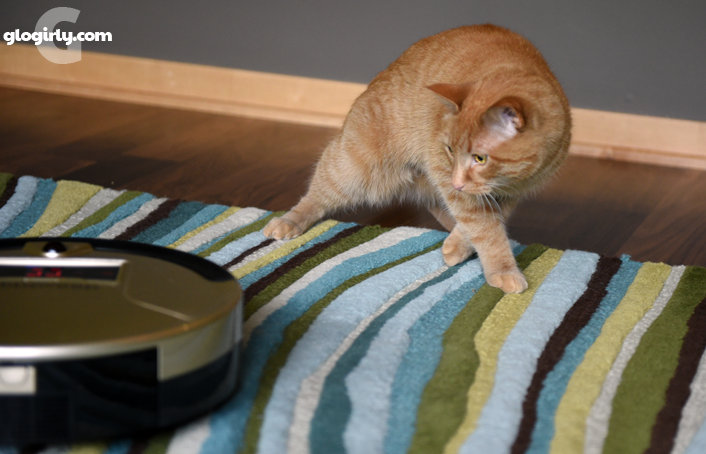 We love our Roomba and have been very surprised at how well it picks up. We kittehz avoid it like the plague. MOL! 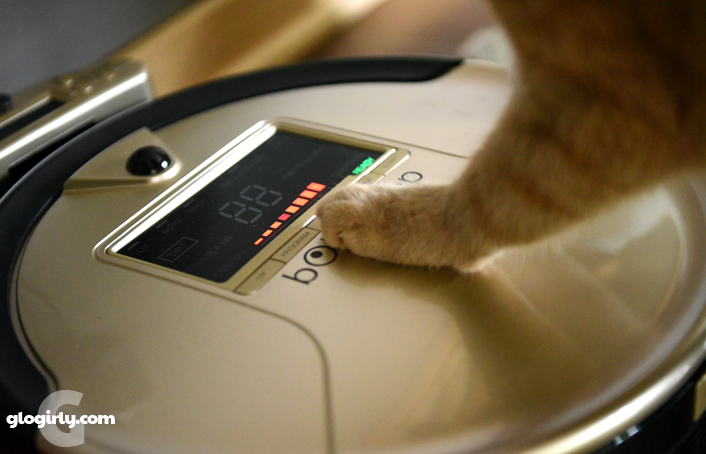 Pee Ess - I think the BobSweep sounds like a better value, too. We're amazed at how calm and inquisitive Katie was. 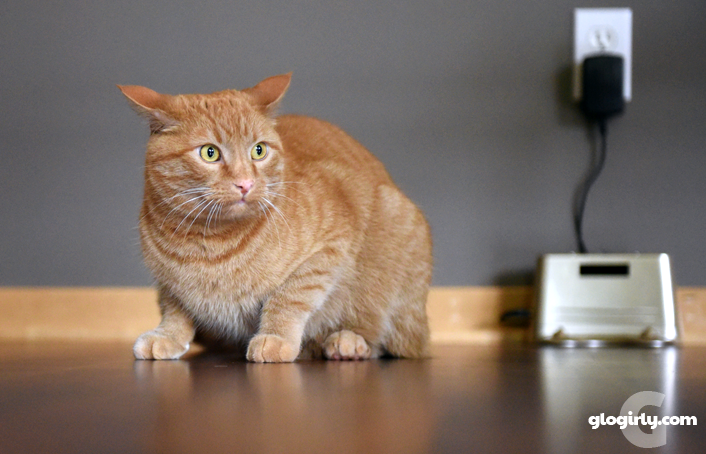 We would have thought it would go the other way and Waffles would have been the braver. Bob is cool and we're amazed that you two are so interested in it!!! 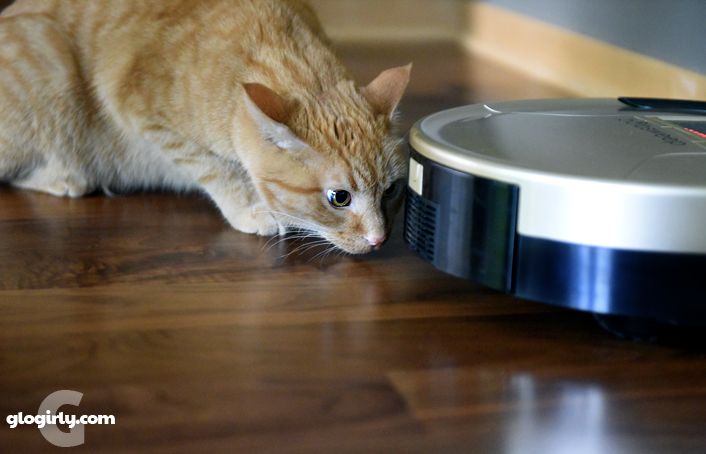 We have a Roomba and watch it when it runs but stay clear of it. I'd probably follow it like Katie does. I love to watch cars and toys that move on their own. 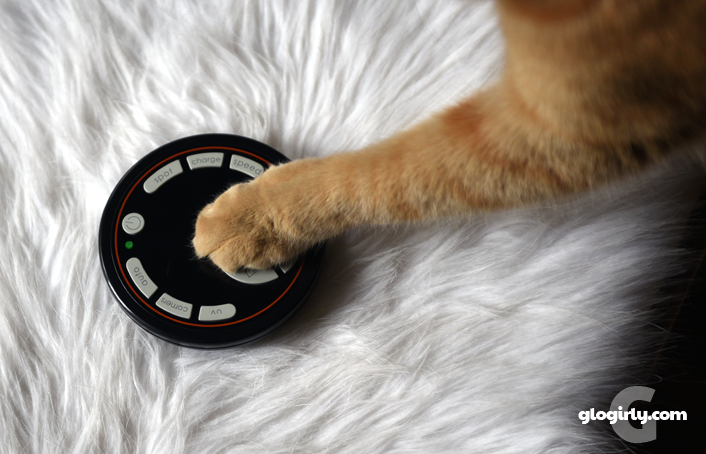 TW wants one of these to get under our furniture. We're so impressed that Katie was braver than Waffles was about Bob! 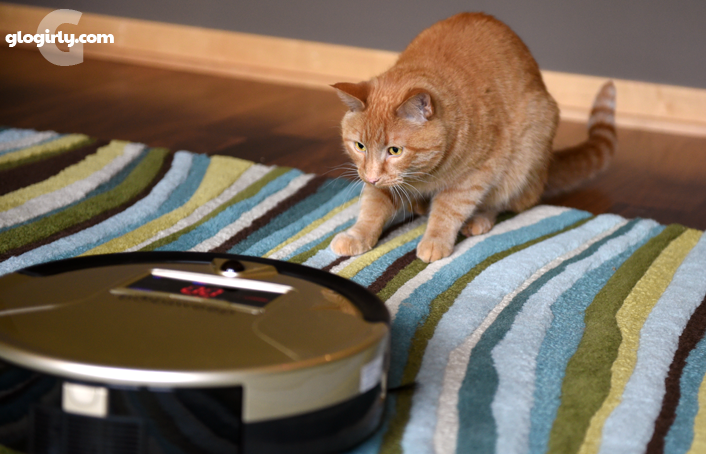 It's interesting to hear that the machine is low-maintenance. 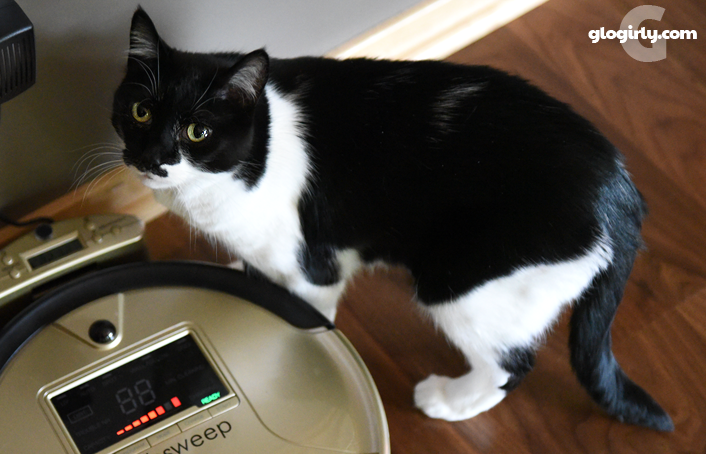 The head peep had a robot vacuum ten years ago and it was very maintenance-intensive. The amount of work it took after every cleaning made it not worth the automation, so it sounds like they have come a long way. Maybe she should take a look at them again! The mom says she needs a bOb really bad! Us...maybe not so much...but it may be kinda fun to watch him. Wish I could afford one for Mommy. She gets very tired of my furs all over. But she DOES make sure I get Furminated a lot, and I suppose that lessens the chore. Still, this would be a nice present for Mommy. If she could give me an allowance. Do you two get one? Wow, look how brave Katie is! way to go!! 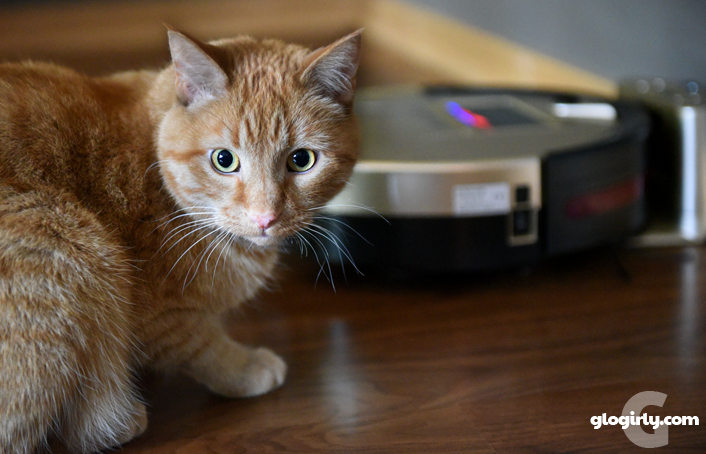 Hopefully Waffles will get used to Bob and ride him around soon. Max would be ALL OVER that. Faraday, ha. Not so much. We may have to check into getting one of those. 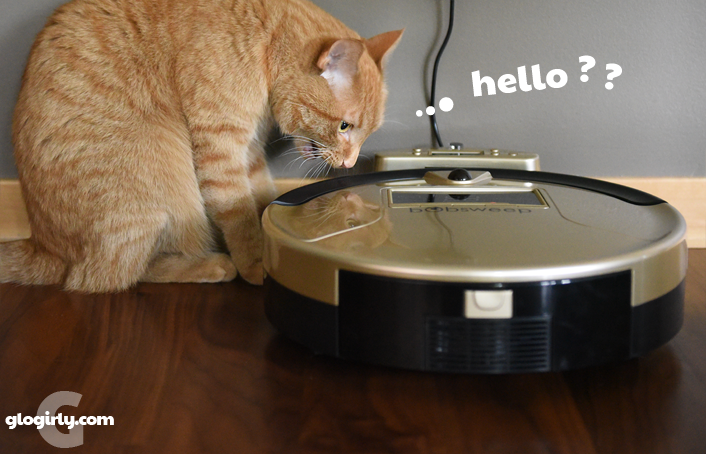 Be brave, Waffles. Ride Bob and show it who's in charge!